Inform users that have not tried Content Translation yet, that they can enable the beta feature. There are several kinds of events that the information can be attached to in order to make it relevant (we should make sure that we don't inform about the existence of the feature more than once for each user, even if several mechanisms are supported). This is one of the experiments defined as part of T90532: Ask users to try the beta feature (tracking) to invite users to try the beta feature when they are creating a new page. Pginer-WMF added projects: Design, ContentTranslation, ContentTranslation-Release4. Pginer-WMF added subscribers: Amire80, Arrbee, santhosh and 3 others. Lots of good ideas, but I would suggest starting with very simple strategies to just raise visibility. Even a well-targeted banner with a clean (multilingual :-) landing page would go a long way. Why not start there and see what it does to your # of testers? @Eloquence, I agree in starting simple, but I would prefer to ask the user in a relevant context (with some chances to be interested in translating). I created a prototype for one of the ideas: tell the feature exists when the user is about to create a new page. Clicking on "Try Content translation" would enable the feature and direct the user to CX to start a new translation. santhosh moved this task from In Review to Blocked on the LE-Sprint-82 board. Pginer-WMF renamed this task from Ask users to try the beta feature to Ask users to try the beta feature when creating an article. Pginer-WMF removed a parent task: T87867: Experiment ways to get more users to translate articles (tracking). Arrbee moved this task from Backlog to Candidates on the LE-Sprint-83 board. santhosh moved this task from In Progress to In Review on the LE-Sprint-83 board. • Nikerabbit removed subtasks: T90722: Cross-browser testing for beta feature invitation, T90529: Measure the effectiveness of editor invitations. santhosh mentioned this in rMEXT9067bb2b06cb: Updated mediawiki/extensions Project: mediawiki/extensions/ContentTranslation…. Eloquence added a project: Roadmap. Eloquence moved this task from Unscheduled to March 16-20 on the Roadmap board. Scheduled for Catalan Wikipedia today (3/19). Deployment was reverted, moved to next week in roadmap. Postponing deployment further due to fix for T92232 not being merged and deployed yet. 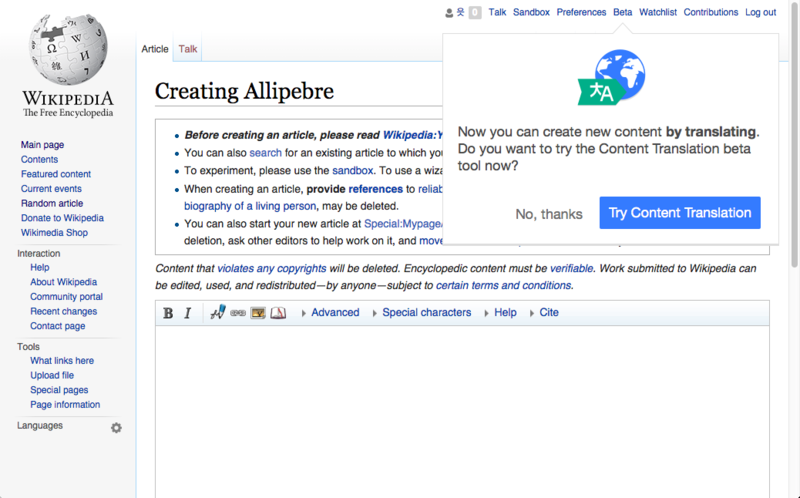 Pginer-WMF added a subtask: T90876: Enable Content Translation new article campaign (beta feature invitation) on cawiki. • Nikerabbit removed projects: Notice, Roadmap, Patch-For-Review. This is a development task. I moved deployment related things to T90876. Sorry for the inconvenience.